One-night stands usually allow for a story the morning after. But what happens when a intimate encounter by two unlikely parties spirals out of control? In Shannon Murdoch’s Virus Attacks Heart, part of the 2014 Planet Connections Festival, we watch the aging Beatrice and youthful Jamie as they weave through a passionate night together. When the encounter leads to one in the hospital, lives are changed and hearts are shattered. Murdoch’s play is filled with poetry. Her words are rich with imagery, allowing for some beautiful moments and monologues. In the world of the play that borders between natural and poetic, the majority of these monologues occur while Jamie or Beatrice is alone on stage, while the other is in another room. It’s an interesting concept to explore. Are the words you speak with a barrier between entirely truthful or does the fact that the other’s presence is missing alter what you say? 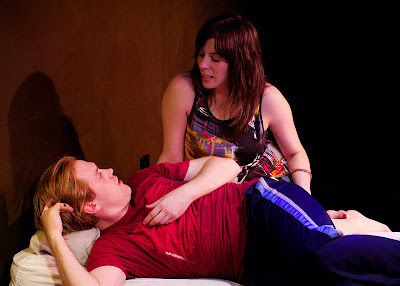 In a play about intimacy, lacking a scene partner is a big challenge. From an exploration standpoint, watching two strangers engage in this was fascinating to watch, however from an acting vantage, both actors seemed to struggle and get lost in making it work. With the monologues pretty much front-loaded in the script, the pacing started off gradual. Additionally, the play is told non-linearly. Attempting to figure out the timeline of the play was quite difficult which truly affected the arcs of the characters. These two strangers are “whiney” in their own respect, but caring about Beatrice’s story is hard to do, especially when her vulnerability comes out toward the end. Since the structure is set up the way it is, as we move toward the end, there are many false endings, or moments that would make for a beautiful ending. With that in mind, the additional scenes after these false endings truly don’t propel the characters forward any further. As Beatrice and Jamie respectively, Gina LeMoine and Luke Wise ease into their parts. LeMoine’s Beatrice is sensible yet yearns for any connection, especially from Wise’s smart beyond his years Jamie. Jamie’s naivety shines through in his moments of pain. However, for a play about connection, or lack there of, their moments together were often erratic, partially due to the nature of the non-linear format. Director Brian Gillespie used simplicity to his advantage. In his staging, the multi-locational play was suggested by pieces, including the clever removable lampshade turned IV drip bringing us to bedroom to hospital room. One of the most beautiful moments of the play was Beatrice’s bus monologue. Combined with Murdoch’s gorgeous words and Gillespie’s ingenious staging, LeMoine recreated a bus and its passengers with liquor bottles, highlighting Murdoch’s imagery. For a play that explores the connection of humans, Virus Attacks Heart is just another play, but what sets this script apart is Shannon Murdoch’s words. With a fine-tuning of the timeline, Virus Attacks Heart will be an even more beautiful piece.